PADI (Professional Association of Diving Instructors) is the world's leading scuba diver training organisation. 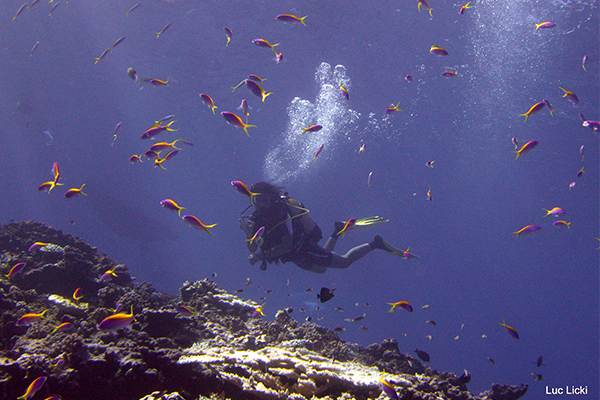 PADI is recognised in more than 175 countries and territories around the world. 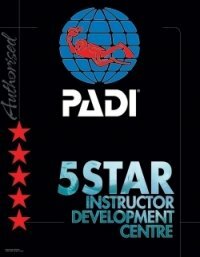 The PADI system is based on progressive training at each person's own pace. All programmes are based on continually updated standards to maintain worldwide consistency and quality. A medical statement or certificate signed by a physician and allowing you to scuba dive is required before the start of any training course. Get your scuba diving certification with the PADI Open Water Diver course - the world’s most popular and widely recognised scuba course. Training consists of both theory and practice. The Advanced Open Water Diver course helps you advance your scuba diving knowledge and skills so you are more comfortable in the water. 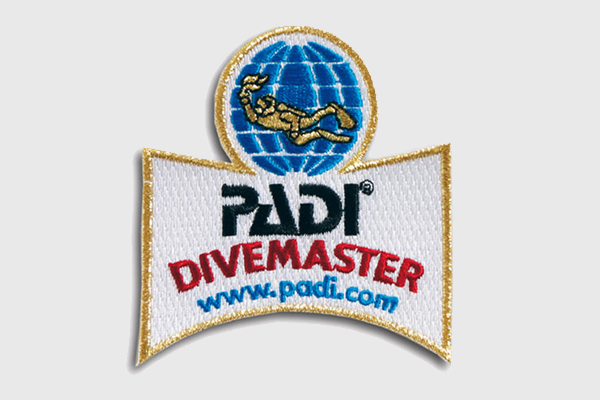 It's a fun way to gain more diving experience while continuing to learn under the supervision of your instructor. Deep diving (usually between 18-30 metres/60-100 feet deep). Three additional Adventure dives of your choice. 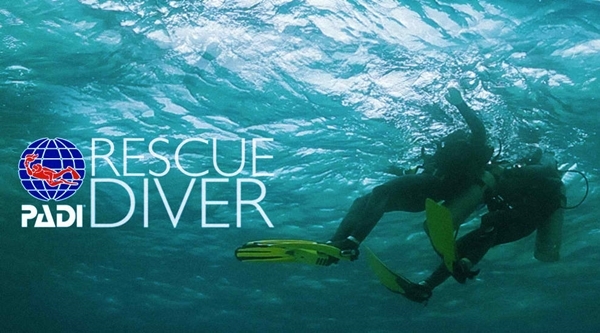 If you want to be prepared to deal with minor and major dive emergencies, become a Rescue Diver. Often described as ‘challenging’ yet ‘rewarding’, this course teaches you how to prevent and manage problems in the water. If you want to start supervising and teaching others, PADI's Divemaster programme will guide you step by step. ABYSS PLONGÉE Dive Centre has a qualified EFR instructor, and the premises and all the equipment needed to complete Emergency First Response training, as well as Primary (CPR) and Secondary (First Aid) Care. These courses teach you new techniques and give you the tools to explore the underwater world in new and different ways. 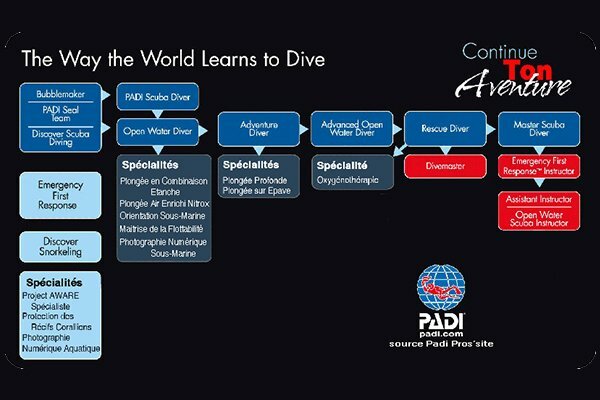 Choose a PADI Specialty course. 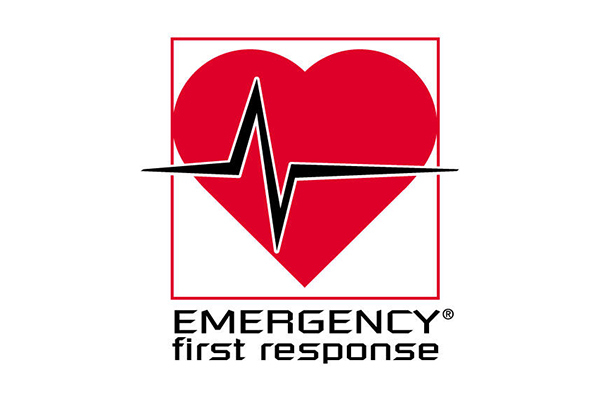 We have a wide range of courses whatever your level. 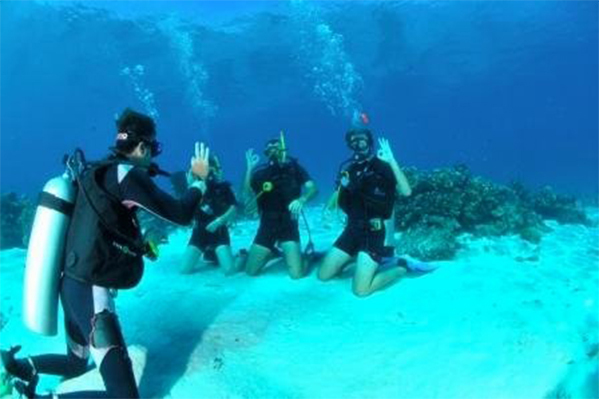 After your first dives you may want to explore the underwater world further. There’s something exciting and mysterious about exploring deeper dive sites. Whether purpose-sunk as an artificial reef for scuba divers, or lost as the result of an accident, wrecks are fascinating windows to the past. Most divers find the wrecks of ships, planes and even cars irresistible because they are exciting to explore, represent a thrilling chance for discovery, and usually teem with aquatic life. The PADI Wreck Diver course teaches you all aspects of responsible wreck diving practices. Enriched air diving is the most popular PADI specialty course. This is because scuba diving with enriched air Nitrox gives you more no-decompression time, especially on repetitive scuba dives. Finding your way back is not a matter of luck! Underwater navigation can be challenging, but with the PADI Underwater Navigator Speciality course, you can master the challenge. Underwater navigation is an essential skill no matter what type of diving you do. It is particularly useful during night diving, wreck diving, or when you’re searching for and recovering lost items underwater. The PADI Underwater Photographer speciality course allows you to progress quickly using modern digital equipment, whether you use a point-and-shoot camera or a sophisticated dSLR like the pros.